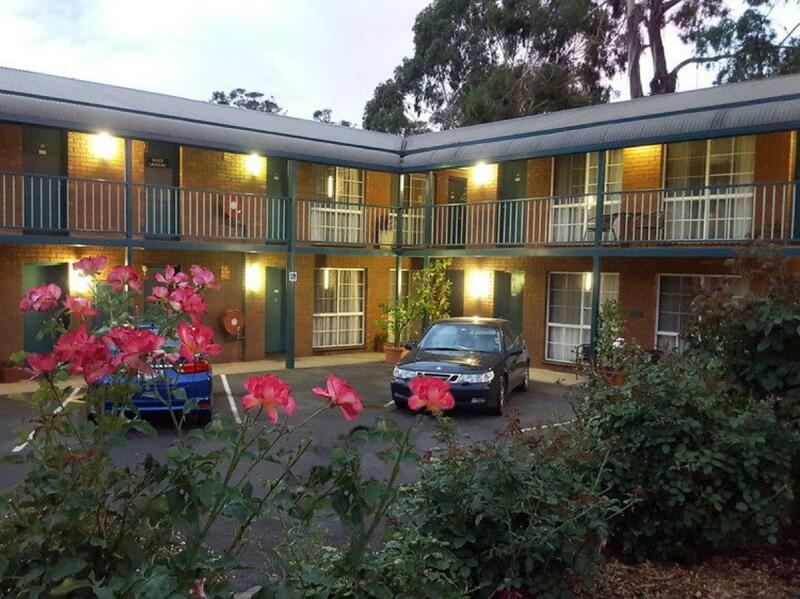 يقع فندق Hepburn Springs Motor Inn، المصمم ليناسب كل الضيوف سواء كانوا من رجال الأعمال أو السياح، في مكان ممتاز في أحد أكثر المناطق تفضيلاً في Hepburn Springs. إن موقع الفندق الاستراتيجي، الذي يبعد 0.3 km فقط عن مركز المدينة، يسمح للنزلاء بالوصول سريعاً وبسهولة إلى العديد من الوجهات المحلية المثيرة. كما يمكن الوصول بسهولة إلى محمية ينابيع هيبورن المعدنية, Hepburn Pool, كونفنت. يعمل Hepburn Springs Motor Inn على ضمان إقامة مريحة لضيوفه من خلال خدماته الممتازة وحسن ضيافته. إن واي فاي مجاني في جميع الغرف, خدمة التنظيف يوميًا, مجهز لذوي الإحتياجات الخاصة, مرافق مخصصة لذوي الاحتياجات الخاصة, تخزين الأمتعة هي جزء فقط من الخدمات التي تميز Hepburn Springs Motor Inn عن باقي الفنادق في المدينة. في الفندق غرف نوم يتجاوز عددها 18، كلها مجهزة بعناية وجمال وبعضها مزود بـ إغلاق, شاي مجاني, مناشف, سجاد, قهوة فورية مجانية. يقدم الفندق مجموعة واسعة من وسائل الراحة المتنوعة، كمثل: مسارات المشي, مسار جولف - ضمن 3 كم, سبا, تدليك, حديقة. إن كنت تتطلع إلى إقامة مريحة وهادئة في ديلسفورد وماكيدون رينجز، فستجد في Hepburn Springs Motor Inn بيتك الثاني. Heating is not great if you are going there on a cold day. It has hydronic heater that does not really work well. When reported to staff next morning they did advise that the can offer additional room heaters. Very basic motel for the price. Arrived at just before 9pm. They usually shut at 8.30pm but knew I was coming and stayed open. Great service. Put heater on in the room as it was a cold night. Very clean and well kept. Hepburn Springs Motor Motel was so convenient for walking to the Hepburn Bathhouse and spa, the Pavilion Cafe and nearby restaurants, and the short drive to the much busier Daylesford with its historic interest. Nice room, clean, everything good. However, we booked in advance; paid in advance; turned up at the appointed time. Whilst we were there, the Motor Inn DROPPED THE PRICE!!... In other words, without booking, or paying at all, you could get the accommodation cheaper than what we paid!! ... Why the hell did we bother to book? We could've just walked in off the street and got a better deal!! I don't like that AT ALL!!! I really nice place to stay with big and clean rooms, very friendly local staff. Location is good, although it is not in the center of Daylesford, it is very close to tourist attractions (parks and springs) and restaurant. Would definitely come back and support this business. My friends and I really enjoyed staying here. The receptionist (or maybe the owner?) was really informative, helpful and welcoming! He gave us lots of recommendations for activities we could do and restaurants/cafes we could visit. Our rooms were preheated, very clean, well lit, TV worked, facilities were great (electric blankets were included). The Motor Inn is placed very close to the Hepburn Springs Bath House and close drive to local town centre. Highly recommend to anyone looking for a relatively cheap place to stay! A friend & I came to stay a night for a pamper weekend, such a gorgeous town and this motel is perfectly located in the centre of it all within close walking distance to lots of restaurants. Friendly, informative staff on arrival and a fast check in were appreciated. Another guest parked their car right outside our room and their car alarm went off several times throughout the evening/morning, that being the only negative of our stay. Clean, friendly, all facilities to make stay comfortable. The service was great. Hydronic heating in the room was great, and the room was quiet. Good, quiet location not far from Daylesford amenities. Warm and clean motel. Great value if you want to save on accommodation and reserve your dollars for food and pampering. Very friendly and helpful staff. Facilities clean and adequate. Would stay there again. This special motel is located near the bath house, a short drive will take you into the main street shops & cafes. The room was great for our Family as we have 3 older children. The sofa bed was not suitable for us so we requested a roll away bed which was very comfortable. The room is very clean and quiet. Fantastic price for the location and we will stay here again. We loved hand feeding the friendly kookaburras. The owners were very obliging and helpful. Motel was close to where we needed to be. We were treated warmly and eagerly by the hosts, and enjoyed our stay in the comfortable, clean and well-appointed room. This is a motel, not a hotel, and offers self-contained rooms accessed from an open landing. We would happily stay again at the modest price we paid through Agoda.